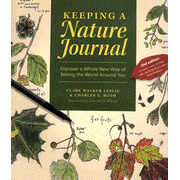 Keeping a Nature Journal is written by Clare Walker Leslie, who is a nationally recognized wildlife artist, naturalist, educator, and author of seven books. She lives in the United States. She wrote, " Drawing even the little things helps to focus the mind, calm the spirit. There's always something to be drawn." Charles Roth is a science and environmental educator and the author of twenty books. He served as Director of Education for the Massachusetts Audubon Society for many years and is active in numberous environmental organizations.To give you an idea of what Keeping a Nature Journal is all about, I have summarized some of the points from Chapter One of the Book. "Simply put, nature journaling is the regular recording of observations, perceptions, and feelings about the natural world around you. That is the essence of the process." (p5)Nature can be recorded in written prose or poetry, drawing, paintings, photographs, tape recordings and even through music. Many people use a variety of these techniques scattered throught their journal. It is Flexible. It can be done at the same time each week, recording lists of birds seen in that hour. It can be a place to write poetry about nature. It can be used to draw what you see when you come across it. It is a personal book of the world of nature around you, relections, observations, things you want to remember, study and reflect upon. It can be done linked to your homeschooling study (birds, trees, clouds etc) or as a separate weekly walk. By spending some time in nature, you will feel "refreshed, refocused, and better able to approach therest of your day. As one eight-year-old said after an outdoor seesion of nature journaling, 'Boy, I have seen the day.'" It helps us to slow down. It gives us the opportunity to make the time to take in the world. It develops Skills and Knowledge. This list is taken from page 13. Self-confidence and the ability to express yourself. Here is the Diamond Python we saw at Coalcliff Beach, south of Sydney. A man caught the snake and we were able to touch and view it up close. 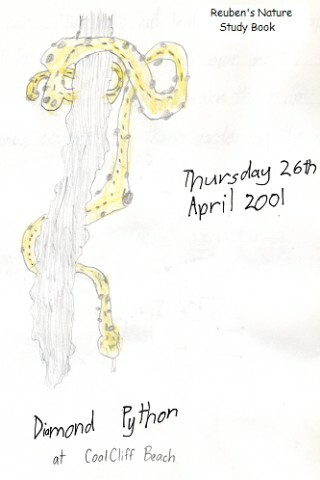 Reuben drew this when he was 9. I can certainly attest to the wonderful skills we have enjoyed as a family by nature journaling.I wish it was a disciplined habit in our home because every time we spend time journaling, we do feel renewed, relaxed and appreciative of what is around us- even if it is just our backyard.Truly, it is a great and worthwhile family experience! The book also contains a selection of pages from Clare's journals. Also included in the book are more resources and suggested readings. Hone your children's powers of observation as they delve into the wonders of the natural world. Filled with beautiful illustrations, this excellent teacher's resource offers tips for documenting what you see, pointers on sketching and watercoloring, suggestions for keeping accurate records, ideas for teaching nature journaling to a group, and much more. Ideal for city and country dwellers alike! (Includes some "New Age" poetry.) 214 pages, softcover from Workman. How to Fit it in. There is only one way to fit it into your busy homeschooling life. PLAN TO MAKE IT HAPPEN!! I know that there is much to do and life is busy, but if you want this experience for you and your homeschool children, you need to plan for it to happen. I do believe that nature walks, discussions, journaling will happen spontaneously at times, and that is wonderful and exciting. But, if you want it to be an on-going habit, it needs to be scheduled in and made to happen. You don't need a lot to make it happen. Keeping a Nature Journal is your inspiration! You will also need an artist's sketchbook. Buy a good one- one that your children will be excited to work in and proud to keep. Apart from that, it is important to collect some field guides. Look in your second hand shops for them (after all, insects don't go out of date). Why not share your findings and add to the Online Nature Journal! Australians can buy field guides from the Gould League. 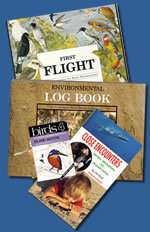 The Gould League in Australia also sells a nature book which you can record observations in. It is called an Environmental Log Book. Add another review... go to Your Homeschool Gallery!